The Importance of Good Gemstone Cutting : John Dyer/Precious Gemstones Co.
How a gemstone looks is all-important. People buy a gem so that it will look good, both to themselves and to others. That’s where good cutting comes in. Many gemstones only sparkle around the outside with a kind of dead spot in the middle. This is known as a “windowed” or “fish eye” gemstone. When the bottom facets are cut at too shallow an angle, the light passes through without being reflected. This results in a stone with a ring of brightness around the outside and a lighter colored “window” in the center. (See photo.) In these modern times “windows” are for computers. With a little practice, a “windowed” or “fish eye” gemstone is easy to recognize. Notice in the picture that you can see right through and even read through the gem on the left with poor cutting. This is a good test to apply to any gemstone before you buy. 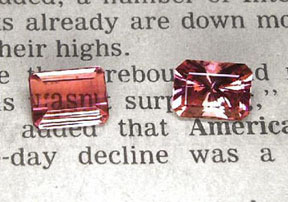 The gemstone on the right was faceted using the correct angles on a modern machine. Poor cutting belongs to a bygone era when customers were not educated or picky enough to care about the quality of their gem. A simple "colored stone" becomes a real GEM with good cutting. Interested in cutting gems? 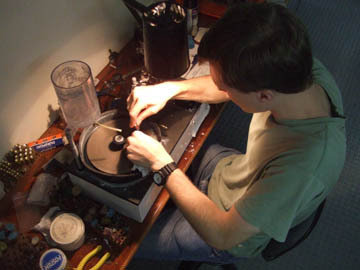 Read John's faceting tips!